It is the morning of Christmas Eve and I woke up so so early (my own body already thinks it is normal after 2 years of being a mom). I just looked at the time when writing this and the time showed 4:44 which I guess is a good sign. I simply believe in these spiritual numbers. I have planned to write this post on Christmas Eve to make sure the thoughts are current and from the same day. I kind of feel lucky to be able to have two Christmases and celebrate Czech Christmas on 24th and then Irish on the following day. However it also means more cooking for me which I personally do not mind though LOL. I am seriously thinking at this stage to film at least a bit today as so many of my foreign youtube subscribers want to know more about the Czech side of life so let’s see if I can manage it all and film the last day of vlogmas. I really want to take the next few days and think about where my blog, social media and youtube will go. What strategy shall I take. However, every time I start to do that I realise that the best thing is to be yourself. It is so easy to get influenced by what others are doing but ultimately the best is to be you and that will be the plan for me. I know there are accounts that are growing so fast due to their immaculate images but I also need to realise that they may have totally different circumstances to be able to create them. I believe that next year will be simply an amazing one. I feel it in my bones and lot of us will reach their dreams and goals. 2018 was somehow up and down with few personal issues to deal with but at the end of the day you always realise it is how you look at things and that always helps you to come out in the best possible ways. And after all we just bought a house in London. What a dream!!! If you ever told me few years ago that we will have a 4 bedroom house in a nice neighbourhood in London I would be very sceptical. So life is good and even more than that. Let’s appreciate even the smallest things in life and be grateful. Merry Christmas everybody and enjoy every single moment of the holidays and may your dreams come true this Christmas. Je Stedry den a ja se vzbudila velmi rano (to tak je kdyz si telo zvykne po dvou letech materstvi a budi se samo). A ted jsem se podivala na hodinky a bylo 4:44 coz je vzdy dobre znameni. A celou dobu bylo mym planem napsat dnesni clanek dnes, aby byl clanek opravdu aktualni a cerstvy z dnesniho rana. Prijde mi to nahodou super, ze slavime dvoje Vanoce. 24. prosince si dame Stedrovecerni veceri v podobe ryby a salatu a dame si nejake darky a 25. rozbalime darky od Santy a od rana pak pecu krocana, sunku a vubec celou Irskou Vanocni veceri v te podobe jak ji znate z Britskych ci Americkych filmu. Docela premyslim, ze bych dneska chtela vlogovat v anglictine, protoze cizinci, co sleduji ma videa na youtube casto chteji vedet vice o Cesku a nasich tradicich. Dalsich par dni bych chtela venovat i tomu, ze popremyslim jakym smerech bych chtela jit v ramci blogu, socialnich siti a youtube kanalu. Pokazde kdyz takto zacnu premyslet se stejne vracim k tomu, ze nejlepsi je byt sam sebou. Na Instagramu se to hemzi dokonalosti a fotkama jako z jineho sveta a nektere ucty rostou zavratnou rychlosti, ale ja si musim uvedomit, ze treba ti lide maji uplne jine podminky na tvoreni takoveho obsahu. Clovek muze udelat vzdy jen sve maximum v momentalni situaci. Ja stejne verim, ze 2019 bude uzasny a ma pry i byt. Tento rok byl takovy jako na horske draze. Jednou nahore a jednou dole, ale podle me je to vse o tom jak se clovek diva na situaci. Kazda vec i ta spatna se deje z nejake duvodu a ma nas neco naucit a je treba tak zivot brat. A uz jenom to, ze mame novy dum v hezke ctvrti, kde jsou 4 loznice je neskutecne. Kdyby mi nekdo rekl, kdyz jsem poprve prisla do Londyna, ze tohle se stane, byla bych velmi skepticka. Je opravdu byt za co vdecny. A tak preji vsem krasne svatky a at se vam vsem splni tajna prani. 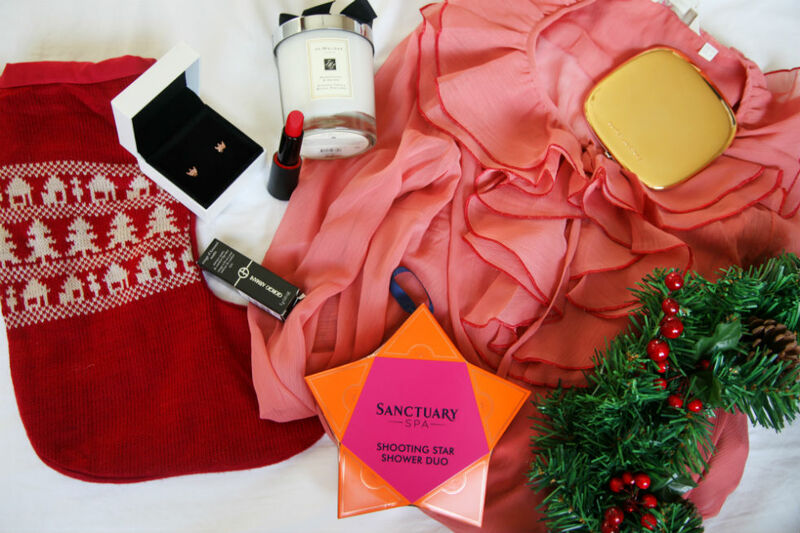 Christmas is round the corner and with that in mind my 2018 Gift Guide is here. This year I have included more fashion and beauty items and less technology as I thought after a long year women should treat themselves to something beautiful and you should treat others the same way. Let’s bring beautiful things to us and feel the luxury. I have tried to include smaller items that could make a great stocking filler as well as gorgeous fashion and beauty items. This stunning pink blouse would make a great gift as it is something you can wear dress down or dress up. I am also loving the Marc Jacobs Luminizer as it is such a luxurious gift and the packaging and the mirror are simply perfection. What a brilliant product to be found in the stocking. Vanoce jsou za rohem a proto prinasim i tento rok tipy na darky. Tento rok jsem zahrnula spise kosmetiku a obleceni a mene technologie, protoze jsem si rikala, ze kazda zena si zaslouzi neco krasneho, aby se mohla hyckat a udelat si radost. A tu radost muzete udelat i vy ostatnim zenam, ktere mate radi. Snazila jsem se zahrnout i drobnejsi darky, ktere by se vlezli do Vanocni ponozky, protoze ty jsou tady v Britanii tradici. Kazdopadne tato ruzova bluzka me hodne zaujala a myslim, ze se da vyuzit jak na den tak na vecer. A vybornym mensim darkem, ale velmi praktickym diky velkemu zrcatku je tento Luminizer od Marca Jacobse. Another Christmas and this year it is so different. Last year I had a tiny baby at home, slept in 45 minutes intervals, had the biggest eye circles under my eye and was still getting over the whole motherhood thing. This year I have a toddler, one wild toddler but I am definitely more myself. Although I cannot wait for few days to do just nothing, eat, drink, watch Christmas movies and just chill. My decision to invest all my energy into youtube took lot of energy and I already have one big energy sucker at home but I did not give up. There were lot of youtubers that do not even have children that were planning to film daily vlogs but failed in the end but I worked hard, very hard on it and wanted to do 24 vlogmas videos until Christmas. So yes I am tired and I feel I really deserve few days off and just enjoy Christmas. So if you guys are into youtube it would mean so much if you subscribe to my channel and thanks in advance for all the support. I wish all of you Merry Christmas and enjoy the holidays. A jsou tu dalsi Vanoce a tentotkrat je to jine a lepsi. Minuly rok jsem mela doma male miminko a spala maximalne ve 45ti minutovych intervalech, chodila s silenyma kruhama pod ocima a vubec jsem se stale snazila zvyknout si na ty zmeny, ktere materstvi prineslo. Tento rok mam doma prcka, ktery se nezastavi, ma vic energie nez stado koni a ja se citim zase sva. Uprimne se nemuzu dockat na tech par dni nic nedelani, i kdyz to ja moc dobre neumim, ale me rozhodnuti se venovat youtube mi vzalo hodne energie, kterou uz tak vysava Liam kazdy den LOL. Letos jsem se rozhodla tocit kazdy den vlogy v ramci vlogmas a to slibilo uz i hodne znamych youtuberu a lidi, na jejich kanaly koukam sama a ejhle, hodne z nich to nezvladlo. Ja uz jsem u konce a nevzdala jsem to, i kdyz to bylo nekdy tezke. A nebudu lhat a jde to videt i na poslednich par videich, protoze jsem proste unavena. A nemuzu se dockat na nic nedelani. Kazdopadne, pokud vas youtube bavi, budu moc rada, kdyz se prihlasite k odberu. To bude pro me ten nejkrasnejsi darek. Vsem preju Stastne a Vesele a hlavne plne lasky a klidu.